Another night spent tossing and turning while staring at your clock and calculating how much sleep you’ll get if you nod off now? If that sounds all-too-familiar, the blame might lie with your late-night food choices. While insomnia strikes everyone at one time or another, and sleep disturbances have many causes, one frequently overlooked reason for poor sleep is a tummy full of food that tends to interfere with your trip to the land of Nod. Below are nine of the likeliest foods to cheat you out of a good night’s sleep, and better choices to help you log some shuteye. 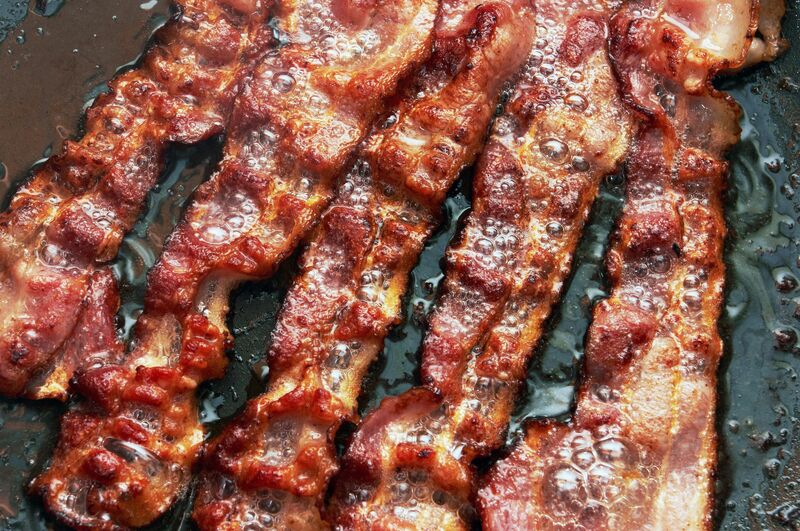 Mmmm, bacon. What isn’t improved by the addition of this fragrant, succulent, crispy strip of goodness? Well, your sleep, for starters. Like aged cheese, bacon and other cured meats (including sausage, bologna, pastrami, corned beef, and ham) contain hefty doses of tyramine, an amino acid that triggers your brain into alertness, not relaxation. Better choice: If you want a crispy, salty snack before bedtime, pop up some popcorn – but leave off the excess salt and butter. That chunk of cheddar sure tasted good, but now you’re lying awake counting sheep. The reason? Aged cheeses such as cheddar, Swiss, Parmesan, brie, and Gouda, contain an amino acid called tyramine. Tyramine stimulates the production of norepinephrine, a neurotransmitter which is part of the fight-or-flight response, meaning that you’ll feel alert and awake. Better choice: A small serving of cheese before bed is an excellent snack, but stick with fresh varieties, not aged cheese. You’ll do well with cottage cheese, ricotta, and non-aged mozzarella. If you suffer from gastric reflux, as does at least 20 percent of the population, you’ll sleep better if you avoid tomatoes and other acidic foods before bedtime. These flavorful and healthy fruits add lots of zest to salads, soups and cooked dishes, but they also tend to cause heartburn – even more so if you eat them shortly before lying down in bed. Better choice: Snack on an apple before sleep. You’ll get a delicious taste, healthy vitamins and no unpleasant sensations to keep you awake. Dark chocolate has a wealth of health benefits: it’s packed with antioxidants that benefit your heart, improve insulin function and increase blood flow to your brain. Unfortunately, dark chocolate also contains caffeine – the higher the percentage of pure cocoa, the higher the caffeine content. While it’s true that dark chocolate’s caffeine content is lower than that of coffee, it is still enough to be significant for many people: up to 80 mg of caffeine in a 3.5-ounce bar of very dark chocolate. If you’re sensitive, that might be enough to keep you awake. Better choice: Munch on a small handful of dried fruit, especially cherries or bananas, both of which contain minerals that aid in relaxation and sleep. A nightcap might seem like a good way to end a busy day, and in fact, alcohol does help you fall asleep faster, but the benefit ends there. Once asleep after imbibing, you’ll face a reduction of restorative REM sleep, and more frequent nighttime waking – both of which leave you fatigued in the morning. So unless you’re enjoying a glass of wine as a prelude to romance, pass up the bedtime booze. Better choice: Sip a cup of herbal tea (be sure it’s non-caffeinated) before bed, and you’ll soon be visiting dreamland. Chamomile, valerian, and passionflower are just a few of the flavorful choices at any supermarket. Spicy foods with plenty of red pepper kick have several health benefits: they increase your metabolism, raise your temperature and stimulate blood flow. While these are good things during the day, they aren’t nearly so desirable at night -- and when you add in the potential for heartburn after that bowl of chili, you further increase the likelihood that you’ll be staring at your ceiling instead of the back of your eyelids. Better choice: Enjoy a small bowl of yogurt or a handful of nuts instead of a spicy snack before bed. You’ll be glad you did in the morning. Fried chicken and other fried foods are undeniably tasty – so greasy, so crunchy, so good. They are also loaded with fat, however, which bogs down your digestive system throughout the night, interferes with your normal sleep cycle and potentially causes heartburn. So enjoy that fried chicken – but enjoy it at lunch or at an early dinner, not as your bedtime snack. Better choice: Nibble on a hardboiled egg, a slice of whole-wheat toast or a slice of fresh cheese instead. Broccoli, cauliflower, and carrots are all super-healthy additions to your diet, but they are best enjoyed early in the evening – at least a few hours before bedtime. While you do need plenty of fiber for good health, a digestive system full of roughage can lead to gassy, bloated sleep, and many nighttime awakenings. Better choice: Have a banana. You’ll get the sweet flavor and a dose of potassium, magnesium, and tryptophan – all of which help you sleep better. A good steak is a meal fit for a king – but it’s also a meal that is likely to leave you longing for shuteye if you eat it too close to bedtime. Eating high-protein, high-fat foods like steak and other red meats within three hours of bedtime leaves your digestive system pulling an all-nighter – and your stomach, intestines, liver, and pancreas need downtime just like the rest of you. The result? Less restful sleep. Better choice: Instead of beef, reach for a slice of unprocessed turkey breast or white chicken. You’ll get just enough protein without too much fat, and a helping of tryptophan as well.